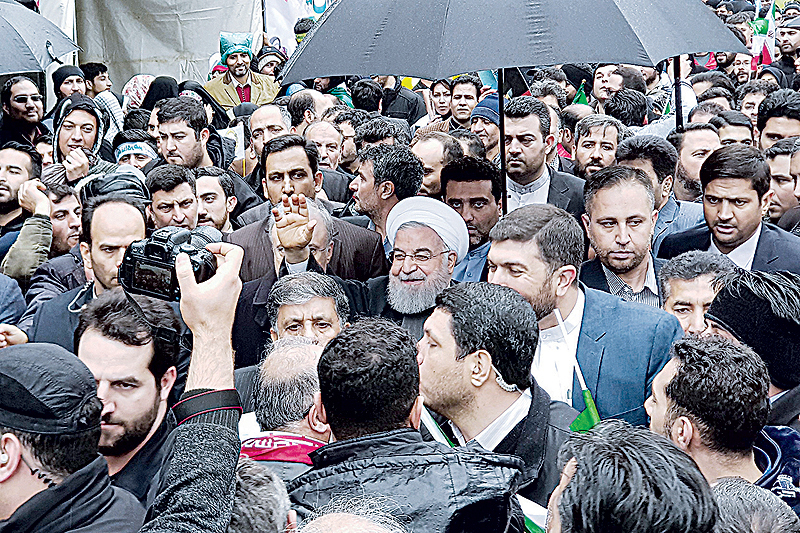 TEHRAN: Iran, which marked the 40th anniversary of its Islamic revolution yesterday, is the world’s largest Shiite Muslim country and a fierce rival of Sunni kingpin Saudi Arabia. Here is some background. Successor to the ancient Persian Empire ruled by monarchs called shahs, Iran installed military strongman Reza Shah Pahlavi on the throne in 1925 after years of upheaval. He was forced to abdicate in 1941 in favor of his son Mohammad Reza. In the early 1950s the prime minister, Mohammad Mossadegh, nationalized the key oil sector which had been controlled by the British. But in 1953 he was ousted in a coup orchestrated by London and Washington. In 1963, Shiite cleric Ayatollah Ruhollah Khomeini became the leader of opposition to the shah’s modernizing reforms. He was deported the following year. Anti-government demonstrations and strikes erupted in January 1978. In the face of the growing protests, the shah left Iran in January 1979 for what turned out to be permanent exile. Khomeini, who had led the uprising from exile, made a triumphant return in February. The shah’s government fell 10 days later and an Islamic republic was proclaimed on April 1, Khomeini becoming its first supreme leader. Iran’s constitution gives the final say on all issues of state to the supreme leader, whose authority trumps that of the elected president. The role was taken by Ayatollah Ali Khamenei, now 79, after Khomeini’s death in 1989. An elected council of vetted clerics, the Assembly of Experts, oversees the work of the supreme leader and has the authority to dismiss him. Next in line is the president, who names the government and is elected for four years by universal suffrage. Moderate cleric Hassan Rouhani, now 70, became president in 2013, winning a second term in 2017. He replaced hardliner Mahmoud Ahmadinejad whose re-election in 2009 sparked massive protests and a government crackdown. Parliament’s powers are limited when compared to other institutions. It is vetted by the Guardian Council of clerics and jurists with the authority to interpret the constitution. The Revolutionary Guards branch of the armed forces is particularly influential and is considered to be the country’s ideological army. Shiite-majority Iran rivals Sunni kingpin Saudi Arabia for influence in the Middle East, the two taking opposing sides in multiple regional conflicts. During the Syrian civil war which broke out in 2011, Tehran has been the main regional military and financial backer of President Bashar al-Assad against Sunni rebels supported by Riyadh. In Yemen, Iran supports Shiite rebels who control the capital Sanaa despite a major military intervention launched by Saudi Arabia and its allies in 2015.